WaterPOD™ Packaged Containerized Treatment Units from AdEdge Water Technologies have been developed to meet the growing U.S. and International demand for small footprint, cost-effective modular water treatment installations. The fully integrated, pre-engineered, pre-wired, packaged water treatment solution combines system performance with economy resulting in an ideal solution for sites where space, cost, and schedule are critical. WaterPOD™ modular enclosures contain one of AdEdge's many types of Packaged Units or APUs treating a wide variety of contaminants for drinking water, remediation, or industrial/commercial applications. A single CTU-20 can accommodate design flows of up to 400 gpm (85 cubic meters/hr) inside the unit. The treatment systems are designed, custom built, and delivered inside the pre-manufactured and customized water tight enclosure. The unit is constructed of painted carbon steel, with steel floor, and multiple other customizable options (insulation, lighting, ventilation, etc) available to meet the site specific requirements. 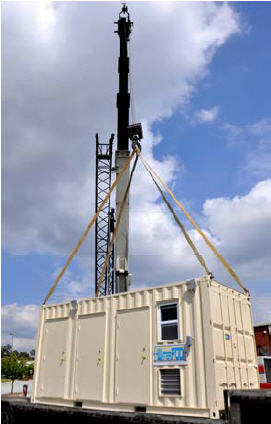 WaterPOD™ systems can be shipped in the U.S or internationally similar to a standard shipping container. Upon arrival at the site, installation and infrastructure is minimal resulting in an ideal solution without a compromise in performance.